During the spring, before and after the spawn of striped bass, you will find Captain Wendell Dudley will often use Gizzard Shad, the largest of the three types of shad. Using larger shad will head you down the road to catching The Big One! During the spring we will fish the surface using float lines, freelines and Planer Boards. Using these methods of fishing better your chances of catching the bigger striped bass that patrol the shallows for bait. Striper are mostly active at feeding during the early morning and late evening. 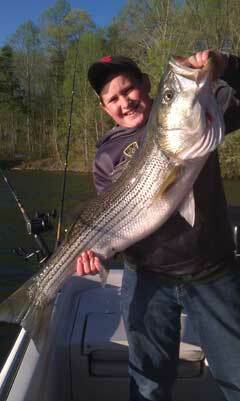 Stripers feed off of shad, shiners and many different types of small game fish. such as Ale Wives, Gizzard Shad and Thread Fin. cooler water which changes our method of fishing. Smith Mountain Lake you will find fish in different depths of water. When fishing for Striped Bass, I generally use two types of live bait – – gizzard shad or ale wives. I use gizzard a lot during the spring to catch record size fish. When the water warms up and the fish go deeper, I use ale wives. You can catch both types of shad using a cast net. Gizzard Shad can be caught during the day in the back of coves. Ale Wives are to be caught at night where light shines on the surface of the water. (refer to video). During the months of December, January, and February, I use a combination of fishing methods using gizzard bait and ale wives. The most successful way are down lines, which consists of a 2 ounce sinker, swivel, 2 foot leader and a lot circle hook. The second successful way are light lines, which are rigged the same and down lines, but with a 3/8 ounce weight instead of a 2 ounce sinker. During the months of March, April, and May, I fish top water with gizzard shad using planer boards , free lines, and float lines. Stripers feed near the surface on bait fish that are in schools, (see video demonstrations on how to use planer boards). Free lines are weightless–just a plain swivel, 2 foot leader, and hook. Float lines are the same, just take your free line and add a balloon or a RediRig float to keep the bait on the surface of the water. During the months of June, July and August, the water temperature is warmer on top causing the Striper to go deep in search of cooler water. The down line is the best method to use so that you are able to get your bait deep enough where the Stripers are located. Using the 2 ounce weighted line, your bait will stay in one spot–not allowing it to escape the Striper. During the months of September, October, and November, the water starts to cool off on top allowing the Striper to come to the surface and feed on bait. Planers, free lines, and float lines will produce fish for you. Captain Wendell Dudley will share with you all of these different methods of catching Striped Bass. You can enjoy catching these fish , while also learning the “how to” of mastering it for yourself!